So are we never going to see even unarticulated vinimates of huge marvel characters we've been asking DST for since... forever? No (Gi)Ant Man or Fin Fang Foom? Or Sentinels? Just nothing? So what do you guys think of the teaser for the new Marvel Avengers game? So I'm not a huge fan of the original Old Man Logan story with Dino-Venom, Old Hawkeye, and such, however after they brought him into the 616 boy howdy is that writing fantastic! That being said much like that scenario I don't usually like the FoX-Men movies but this movie looks GREAT! I'm excited to see the Reavers and am I mistaken for thinking that one shot was of Lady DeathStrike trying to stab him? What do you guys think is the future of the Property owned by Fox? I think I remember Kevin Feige almost explicitly denying any kind of merger possibility :/ it's what I'd like to see, but this movie seems like it'll probably rake in enough cash for Fox to warrant rebooting their franchise. 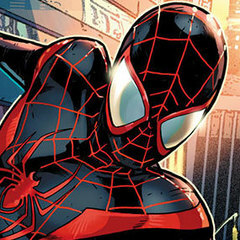 Yeah, yeah, I know, "yet another wishlist thread" but come on, the forum's been kinda dead after the update (lack of news and all, so I figured, what better way to pass the time than take a look at Marvel's even newer costumes! I mean, those old tights that debuted like, a year ago, are like, super-old now. Time for a change! Kidding aside, I spotted some designs that'd make for some fairly interesting mates, so yeah, here you go. Or, you can just bypass all that and just curse Marvel for having another relaunch so soon, I won't judge you (truth be told I'll join you)... For the complete look at the new titles, here's a link: Marvel NOW! 2.0 Titles | As a sidenote, it's been confirmed that certain series have just been ommited from this catalogue, and will show up in the October solicits as regularly. So, no X-Men cancellations. Anyway, I won't bomb this thread with pics, rather, I'll post just one. Mainly because it's one of the two or three titles I'm anticipating 9it's still Bendis writting, but eh, I'm either too optimistic, or too starved for a Doom solo that I'll take anything I can), and because I think it'd make for a good mate. As you can see, these are Maleev's sketches for Doom's armour. Not terribly excitting, as it's mainly the ANAD Armour with a hood & cape combo, a different paint-job, and a few minor touches. Just for the novelt of it though, I'd love a mate, because, even though it's a boring Iron Doom design, it's a darn good Modern Doctor Doom Redesign. And good as it may be, the MvC3 Doom has some serious issues. It's basically a small statue at this point. So, yeah,if I had to choose one fig from this new batch, I'd choose Vic. Maybe he can be packed with his ANAD look, the suit & tie one. Now, you might be thinking "what about the F4 ban", but dunno, I don't think Marvel would publish a Doom solo titled "Infamous Iron Man", while also putting Ben on the GotG, and Johnny in the Inhumans. Something tells me that come this year's SDCC, we're in for a surprise, considering the recent Fox & Marvel X-Men TV Show deal. Or I'm just day dreaming, who knows? But I'd surely take an Iron Doom mate... Apart from this one, there aren't many terribly new looks. There's Thor Odinson, the USAvengers, the Classic Thunderbolts with slight costume tweaks, Prowler, Mosaic, plus all the ANAD looks that haven't been made already. You could come up with a great ANAD/NOW! 2.0 Wave, truth be told. So, in the spirit of wishlisting, here's my dream wave: Iron Doom/Victor Von Doom (Or more like Vincent Cassel) Captain America (Steve Rogers)/ Black Widow Moon Knight (Mr. Knight or Super-Hero look)/ Black Panther Unworthy Thor/ Spider-Man 2099 So, yeah, there you have it' I'd also like Chulk and others, but these would be main wants. Yeah, it's A-List heavy, but I've got my reasons. ANAD Black Panther has a really cool Mass-Effect like Mask (it's from Hickman's run, but here it's used more often) and I think this plus his "weapons" would make for some great extras. ANAD Black Widow has a new look, with short hair, which I love, plus, the TRU 17 one was kinda wonky. Unworthy Thor actually looks cool, and Spider-Man 2099 could be a very fun mate. Iron Doom/Vic I already gave my thoughts on, MK doesn't need any more info, and HYDRA Cap, well, I like him, weirdly enough... Oh, and one more thing... Here's your reference DST, now get on that Moon Knight Wave! And yeah, that's Astronaught Marc Spector. It'll be debuting in MK #5, which is a collection of various "trippy" sequences from various artists. dejanon16 posted a topic in Custom Creations & Artwork! Roccothegreat posted a topic in Custom Creations & Artwork! http://www.comicbookresources.com/?page=article&id=54386 http://www.starwars.com/news/sdcc-2014-inside-marvels-new-star-wars-comics-exclusive Marvel announced these 3 last night. A new Darth Vader series, a Leia series and a general Star Wars one. All these are ongoing and I'll be surely picking them up, since these are the new canon (everything else besides I-VI, Clone Wars and Rebels, is fan-fiction). I just hope that down the line they either re-introduce the EU or make up their own. The O3 are good, but we need some fresh stories. I have to say though, I'm quite excited. Disney is getting on the Star Wars track and who knows? If TNBC does well, Star Wars mates may not be such a far fetched dream after all... So, will you picking these up? Are you frustrated that everything SW related of the past few years is not canon? No info has been released yet regarding the scale but we'll know when comic con rolls. So, anyone planning on buying this to use as a background for the Avengers minimates? PS: I would post it in the 1/6 fig thread but seeing as this is more of a set than a fig I decided to create a new one. Rocco The Great art , prints & more. I have almost every minimates, and the best way to display them specially the marvel is by team and storyline. My question is where to put the Gamma Hulk, the translucent one? 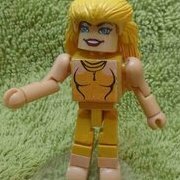 One of my favorite Minimates waves is the Jean DeWolf Saga. It's one of the most, if not THE most "themed" wave yet to be released in the Minimates Universe. That being said, what other story lines would you most look forward to seeing as a themed Minimates wave? To start, I'd love to see a Second Coming story line. The costumes are still modern and blend well with other recent sets such as AvX. It features many major characters and gives an excuse to release some fun and unique figures as well. 2-packs could feature : Cable w/ baby Hope Hope (w/ phoenix flame) Rogue Nightcrawler (w/ phasing legs) Cameran Hodge Purifiers (army builder) Bastion w/ Nimrod armor Wolverine (berserker rage) PS this is my very first post. so, while this may not be minimate related, I figured it'd be a cool fun thing to do and would give me a chance to practice drawing with my tablet. anywho, every week I will post a new line up for you all to vote on, I expect the art to get better as I go, since this is the first time Ive really done something from scratch digitally, so bear with me. the first two fights will be up from now until next Thursday. Round 1: Mister Fantastic vs Elongated Man Mister Fantastic: Reed Richards, a brilliant scientist, set off on an exploratory mission in space with a crew of his friends and family. While on the mission, their ship was hit with cosmic rays, changing their physiology and giving them great powers. As Mister Fantastic, Reed has superhuman elasticity, malleability, shape shifting and endurance. Reed also has made numerous incredible scientific discoveries, such as harnessing the power of unstable molecules and creating a portal to the Negative Zone. Elongated Man: Ralph Dibny spent his early life studying chemistry in order to create a formula from the Gingo fruit of the Yutacan, which gave him his elasticity. Ralph is married to Sue Dibny and together the too make a detective duo, using both extraordinary gadgets and detective skills to solve crimes. As Elongated Man he has superior deductive reasoning and a finite ability to stretch and shape his body. Round 2: Sandman vs Clayface Sandman: Flint Marko (formerly named William Baker) was mutated by irradiated sand in a nuclear testing zone while attempting to escape Rykers Island. Marko gained the ability to become sand, shapeshift using it, and a various other ways of manipulating it, including controlling sand, changing his size,the ability to change his density and create and control copies of himself. Clayface: Matt Hagen was a past his prime actor who went through a disfiguring car accident. Desperate to regain his image, he allowed business man and criminal; Roland Daggett, in return for a chemical compound named "Renuyu" Matt has to commit crimes for Daggett, utilizing his acting skills and the chemical. After prolonged exposure, Hagen is transformed into a monstrous shape-shifting creature. Clayface has shapeshifting abilities, as well as the ability to increase and decrease his size and density, he can create and control copies of himself, change his voice and has super strength. Feel free to ask questions, leave comments, make requests and vote!